You can't keep yourself from dragging nasty filth aboard your truck after a day afield, but you can keep it from muddying up your vehicle's floor. It's easy with this 2-pc. 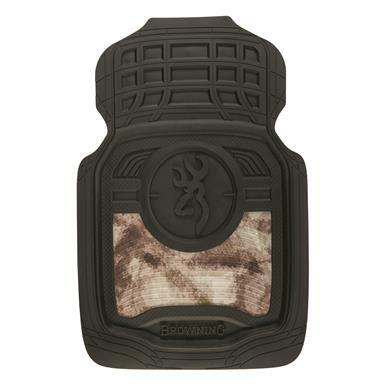 set of Browning® Chevron Front Floor Mats. They're decked out in A-TACS AUTM Camo, too, for a nifty appearance. And because they're trim to fit, you're guaranteed a great fit. Complete the look of your vehicle's interior and add the A-TACS AUTM Camo Low Back Seat Cover (Item 704716), the Steering Wheel Cover (Item 704687) and the Bench Seat Cover (Item 704686). Now that's one sweet setup.